Welcome to our selection of holiday rentals in Faro. Faro is the largest city in lower Portugal and is also one of the most pleasant. From the busy town centre to the attractive seafront and the city's vibrant nightlife, Faro has many attributes that make it a popular tourist destination when visiting Algarve. It has been a prominent location since Roman times due to its proximity to the lagoon and the port. Modern Faro has embraced tourism and has developed further because of it becoming the fashionable acclaimed city it is today. There is an international airport outside the city. 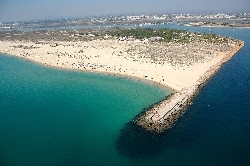 Many tourists come for Faro's beaches, which are particularly inviting with their golden sand beaches and sparkling blue waters. Hot days in Faro are always accompanied by crowds of people on the beach. And as is typical of large cities, those wishing to just spend a relaxing day on the beach are well catered for. Everything you need is only a very short distance away from pretty little cafes and various quality restaurants to shops and some great bars. If you go towards the harbour, you will see the older side of town where many of Faro's historic buildings are. These buildings are centuries old and have a wealth of history to tell. The Igreja do Carmo Church for example from the 17th century is particularly creepy. The Capela dos Ossos (Chapel of Bones) is adorned by the human skeletons of long deceased monks on its walls. Far from being intentionally macabre, the chapel came about when construction of the church displaced a local cemetery where the hundreds of monks were buried. Here you can actually feel the history of Faro up close and personal. Its not that well known since many tourists just overlook it completely on their way to the hot beaches however its worth a visit for those not faint of heart. But for those visitors to Faro wishing for a more wholesome and much more light-hearted vacation, there are also many quality art galleries to walk around and admire. Or if art galleries aren't your scene then there are numerous activities to enjoy several landmarks and important buildings with intriguing architecture to behold such as the other churches and cathedrals. Due to its size and range of services, facilities and activities, the city of Faro is a great place to come for a holiday. There is literally something for everyone here whatever their interests. It is in an ideal location for exploring the rest of Algarve if you wish to travel. Looking for self catering holiday accommodation in Faro? Then below is a selection of holiday villas in Faro and holiday apartments in Faro that can be rented direct from their owners. You can either click on each listing for further details or you can use our search engine on the left if you are looking for something in particular.